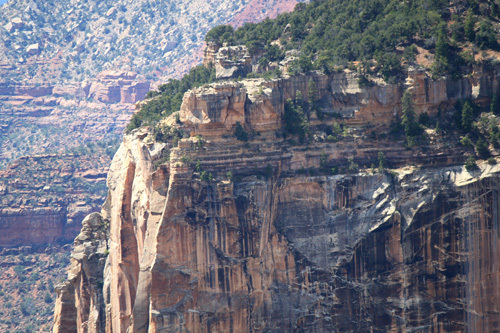 The rock formations of the Palisades – and a thought or two. In the 1890’s, the huge, majestic cliffs in New York State and New Jersey, known as the Palisades, were being dismantled and turned into railroad ballast. Ballast is the stones that form the trackbed around and underneath railroad ties. These great cliffs, made millions of years ago, were considered disposable, to be sacrificed on the altar of modern industrialization. Through the efforts and generous donations of individuals and groups who worked to have the land turned into a park, finally in 1947, the Palisades Interstate Parkway was established, and the Palisades were saved. On August 22, 2012, History Channel Two aired an episode of “How the Earth Was Made” featuring the geology of the Palisades and the New York City area. The natural history of the Palisades and the whole region is a remarkable tale. 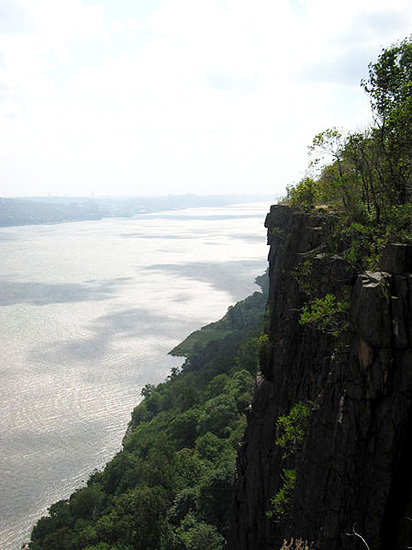 The Palisades run for forty miles along the Hudson River. During the last Ice Age huge boulders broke off from them and were carried along to be deposited in what is now Manhattan’s Central Park. Four thousand miles away, in the Swiss Alps, there are also huge boulders that were carried along by glaciers at the end of the last Ice Age, until the ice melted, and the rocks landed where they still stand today. In the most distant past, these two sites were not as far apart as they are now. The giant glaciers of the ice ages left traces that are visible and that can be interpreted by geologists. The amounts of ice towering over the landscape are astonishing to try to imagine. Fifty miles north of New York City is Bear Mountain; it has “chatter” marks, which are indicative of glacial action. Glacial scratches, or striations, are caused by the boulders being dragged along by the moving ice. Gouges in the rocks indicate that the glacier covering Bear Mountain was at least 1200 feet high. It is known, in fact, to have been much higher, at least one mile in depth. The ice of the glacier covering the New York area (and most of North America) stretched up to four times the height of the Empire State building, and the Hudson River was formed when the massive ice gouged out a channel for the river. It is possible to trace the outline of the story of what happened to the rocks, going back to the most ancient times. Much, much earlier, two hundred and fifty million years before the last Ice Age, there was just one big continent on earth called pangea. It split apart, with volcanic upheavals engulfing all the land that is now Africa and Asia. A great rift ran the length of the divide between Europe and North America, Africa and South America; which, as it widened, became the Atlantic ocean. 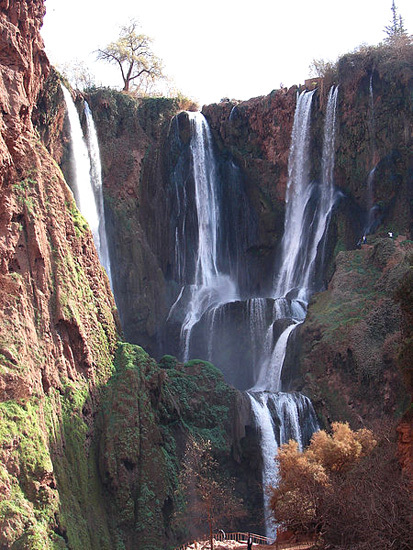 In Morocco and in South America, one can find the same kind of gigantic cliffs as the Palisades. During the time of pangea, New York was adjacent to Morocco. They were next door neighbors. Europe and north Africa were a stone’s throw from North America, until the great volcanic rift drove the continents apart, leaving them on opposite sides of the Atlantic. When we contemplate the hundreds of millions and billions of years that rocks have reigned on the earth, human history seems but a puff of smoke wafting in the wind. Have you ever felt, at an odd moment, that perhaps you were there long ago, at a time when only the rocks were there? Many people do not buy the popular theory that we humans are both uniquely conscious, more conscious than all other beings, and evolutionally superior, having been placed at the tip-top of the ladder of evolution; and, it doesn’t stop there — we are also presumed to be the crown of creation in the eyes of God. It could be, though, that the eyes of God prefer to look elsewhere. Simply put, God may not agree with us about our exalted position. Instead of being preoccupied with humans, He, or She, may prefer to fly with the swifts among the cliffs and the rain clouds, or play with the monkeys in the forest tree-tops on long summer afternoons, or join the profusions of wildflowers nestled among the mountain rocks. Who knows? It would seem that the rocks too have a soul – a deep, profound, immutable, sacred soul that knows and remembers all the aons – all the worlds (far more worlds than we know about) that have come and gone on this earth. The rocks’ many-aspected souls are conscious in ways that we can never attain to. As they tower – red, black, blue, and gray giants looking out over the lands and the winding, silver rivers — they will likely remember our world too after we are gone. The farther we, as humans, travel away from the source of life, the more lost we seem to become. The more we “use” nature, instead of being nature, the more we do not belong. Surely, it is only when we return to being part of nature, when we become once again the wind, the waves of the sea, the wolves in the hills, and the luminous eyes of the owl, that we may find the beauty and purpose of our existence. The universe is longer and larger, older and more profound, than we can imagine, and a little humility on our part might not be amiss. For a perspective on the vastness of all things, it is written in the Ramayana, one of the great epics of India, that once, ages ago, the hero Rama shot an arrow deep into the night sky. It is still traveling. When that arrow has encircled all the great expanses of the stars and the entire cosmos, it will return again to Rama’s bow, and then the universe will end. Top photo: Original uploader was Erhudy at en.wikipedia / Wikimedia Commons / This file is licensed under the Creative Commons Attribution-Share Alike 3.0 Unported license. Subject to disclaimers. / The Palisades on the New Jersey side of the Hudson River.